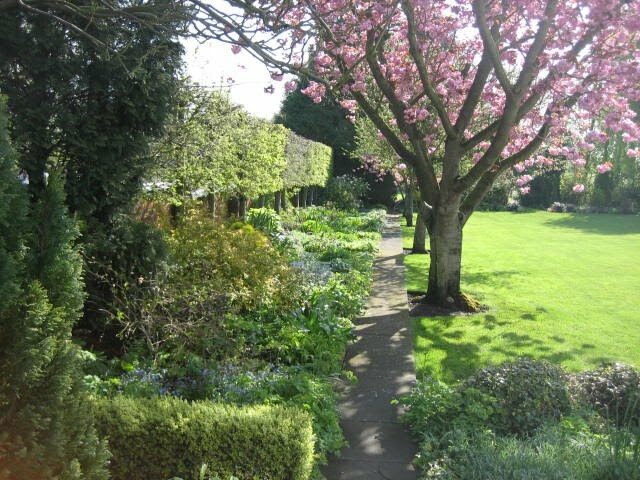 Eco Garden Maintenance provide professional garden planting, feeding, pruning, weeding and training services in the Leeds, York, Selby, Wetherby and Tadcaster areas. We pride ourselves on having extensive plant and horticultural knowledge together with the necessary skills and tools to make your garden borders look their best. Knowing when to prune a plant, which type of soil and situation they like and other cultural requirements are all very important when creating and maintaining breath taking borders. Many gardeners don't know a plant from a weed or severely hack back every shrub they see to within an inch of it's life. Eco Garden Maintenance is definitely NOT one of these. Of course, there are examples of borders which contain only one type of plant such as a rose beds or a shrubbery. These require different management techniques to a mixed border. If left to the untrained this task can result in plant seedlings being discarded along with the weeds and plants left that are actually weeds. For each weed there is a best way to eradicate it, some can be hoed off whilst others require the removal of the whole root. In cottage gardens and borders where the self seeding of plants is to be encouraged, there will be a considerable amount of seedlings visible. These seedlings usually have leaves which are quite different from those of the adult plant and so knowing what the seed leaf looks like is very important in the identification of plants you want to keep. Similarly, weed seedlings can look different to mature weeds. It is useful to know the life cycle of weeds and when they flower so that the correct timing of removal can be used. Removing weeds before their seeds have been dispersed is a useful way of minimising weed populations in the future. There are numerous problem weeds, mainly perennials, which spread by underground roots. In established borders these can be very difficult to eradicate totally as any portion of root left in the soil will produce a new weed plant. 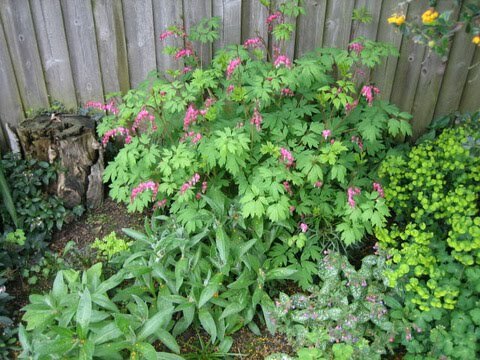 The roots often spread in to the root balls of shrubs and perennials where they cannot be removed without digging up the garden plant and extracting the weeds roots before replanting. Sometimes this is not a practical proposition so the best way to deal with them is to remove the top growth regularly in the hope that the root becomes starved of energy and dies. Shrubs planted in borders with no thought for their growth habit will often become too large for their position and hence require pruning. It is also recommended to hard prune some species of shrub (Cornus alba sibirica , Buddleja davidii) to produce more pleasing results than when left to their own devices. We see far too many flowering shrubs which have been pruned with hedge cutters into topiary shapes such as domes. In our opinion this is wrong, wrong, wrong. It is possible to prune shrubs to limit their size and still leave their natural growth habit and appearance intact. This is a technique that Eco Garden Maintenance will use to prune shrubs unless the client specifically requests otherwise. There are shrubs and trees which are suitable for shaping (topiary) and these are often plants such as yew, box, holly, bay and privet. Although some of these do flower they are usually grown for their foliage and their ability to be clipped into shapes. These are garden plants which are non-woody and live for two years or more. Most are herbaceous, dying back in autumn and producing new growth the next spring. They all require cutting back at slightly different times, some give interest to a garden if left over winter, and others are best left until spring before cutting back as the dead growth provides the plant with some protection from frost. In this country we are far too tidy in the garden which robs wildlife of places to hibernate and sources of food. Eco Garden Maintenance like to help wildlife where possible and are aware that it is beneficial for the control of pests. Many perennials grow to a substantial mature height which makes them prone to collapsing and falling over. Whilst the stems are still alive and flowering, the attractiveness of a border can be seriously diminished by this. The answer is to provide some support with either a rustic homemade structure or something designed and made specifically for this purpose. If the plant is to grow through the support and become less obvious to the eye then it must be installed in good time. We can make these supports for you or advise on suitable examples to buy. Roses are many peoples favourite flower and hence are present in many gardens. Sometimes they are grown in isolation with a bed all for themselves. Also they can be found dotted around in mixed borders amongst shrubs, perennials and other plants. When grown in their own border and are in full flower the sight can be breathtaking. But many people complain that the bed looks dull and boring the rest of the year. Interest can be given to the border all year round if the roses are under planted with a mixture of plants to give colour and foliage at times when they are needed. This under planting needs to be of the ground covering type as to not get too high and interfere with the roses. We have had huge success with using a few evergreens such as winter flowering heather and aubreita to give presence through winter and colour when the roses are not in flower. Unfortunately roses are very high maintenance plants and suffer from many pests and diseases, most of which require chemicals to control them. Blackspot, rust and aphids can be a huge problem which all affect the vigour and flowering of roses. Also, they are gross feeders and like a organic matter rich soil with plenty of available nutrients. It is recommended to keep the bases mulched and feed them with a rose fertiliser. We prune roses in february and march when the growing buds are visible but before leaf emergence. This is done to just above an outward facing bud to give an even appearance to the plant and prevent the middle becoming congested. When a tree is planted in the wrong place or becomes too large we generally recommend that they are pruned to let more light into the border and to let rain penetrate the canopy, thus providing much needed moisture to the plants under it. This can be done by reducing, thinning or lifting the trees crown. Eco Garden Maintenance usually carry out this type of work in winter when the tree is dormant and damage to surrounding plants can be minimised. Soil under a tree's canopy is usually very dry, nutrient poor and compacted. To relieve compaction we advise that the area is aerated by inserting a garden fork and then waggling it back and forth. The fork should be inserted at regular intervals when the soil is wet enough to allow penetration. To help the soil hold moisture and provide nutrients it should then be mulched with a generous amount of organic matter. This covers a whole multitude of different plants such as roses, clematis, ivy, jasmine and honeysuckle. Some have the means to climb up a structure unaided (ivy, climbing hydrangea) where as others need require a framework such as trellis to attach themselves to. We have much experience with the pruning and training of climbing plants as well as constructing any support needed. There are bulbs to provide flowers all year round. With careful selection and planting, as one finishes flowering another is just beginning and so on. Bulbs in a mixed border can present their own maintenance problems. The stems must be allowed to die back in order for the goodness to return to the bulb. This can look unsightly until sufficient time has elapsed for the stems to be removed. When the stems are removed there is no indication that the bulbs remain under the soil and so it can be very easy to forget they are there and dig them up by accident. These are useful plants for filling up temporary gaps and providing blocks of high impact colour. Many of the hardy ones self seed freely and so provide new plants for free. This is very much the case with foxgloves and the poached egg plant. Non hardy annuals are usually planted after the risk of frost has gone and usually will flower all season long until the frosts return and they are killed. The year after they must be replaced with new plants. This can be costly if done on a large scale. A border can be beautiful and colourful with texture and interest all year round. Please contact Eco Garden Maintenance to enquire about what can be achieved in your garden borders.